When the Hogwarts Express opened on July 8, 2014, it marked a turning point for Florida's theme parks. It was also the grand opening of Diagon Alley, the second Harry Potter-themed land at Universal Orlando. Predictably, the land has generated huge crowds and additional revenue at the resort. But the Hogwarts Express may have had an even bigger impact on attendance, earnings, and the relative distribution of visitors among Florida's parks. It's part of Universal's clever plan to aggressively expand and capture market share. The train ride is an especially bold component of the resort's expansion and transformation. Potter-mania began in 2010 when Universal Orlando debuted The Wizarding World of Harry Potter at Islands of Adventure. Although the land was only open for about half of the year, the resort registered a 30% bump in attendance for the park. In 2011, the first full year that The Wizarding World was open, Islands of Adventure experienced another 29% growth spurt. It leapt from the world's 16th most visited park in 2009 to the 10th position on the global countdown in 2011. Clearly, fans have been wild about Harry. The Wizarding World of Harry Potter- Diagon Alley also catapulted Universal Studios Florida, the sister park at which the expanded land is located, to new attendance highs. It experienced a 17% increase in visitors in 2014, which put it on par with Islands of Adventure and moved it up a few slots on the worldwide chart. OK, you're probably thinking, the new Potter land brought a bunch of new visitors to the park. They ogled at the fire-breathing dragon perched atop Gringotts Bank and marveled at the Escape from Gringotts ride nestled inside the bank. What does the train ride have to do with anything? 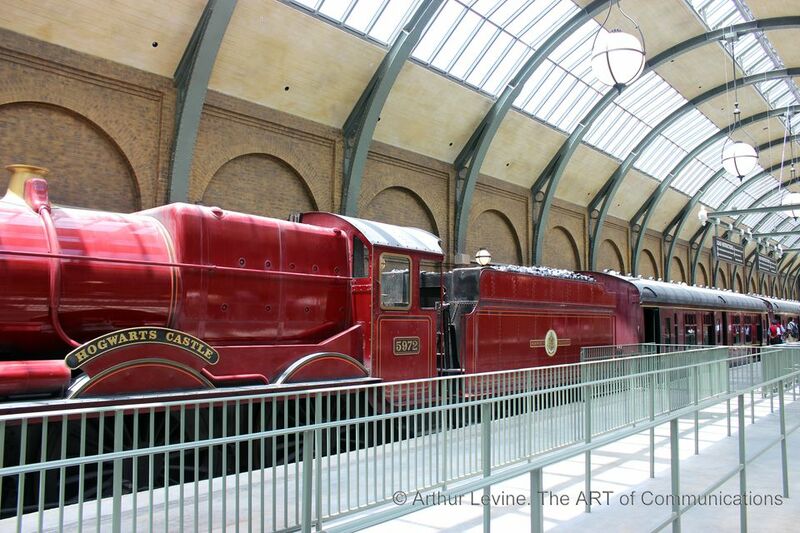 As our review of the Hogwarts Express attests, it's a wonderful attraction. But it also represents a brilliant strategic move. Here is where Universal's business savvy and sheer bravura, if not bravery, come into play. Universal Orlando has two Potter lands spread between its two theme parks. The original area, called The Wizarding World of Harry Potter – Hogsmeade, showcases the Scottish village where the Hogwarts school is located. The Diagon Alley land portrays the London side of Rowling's mythological landscape. And just as in the books and movies, the two locales are connected by the Hogwarts Express. Rather than a mere conveyance to move guests between two points (like the monorails at Disneyland and Disney World), the train itself is a highly themed attraction. Whether they originate in Universal Studios Florida or Islands of Adventure, guests want to board the train to get the complete, seamless Potter experience. But here's the thing: Not just any park visitor can hop on to the ride. In order to get past the conductors at either train station, visitors have to show that they have a two-park ticket. After all, in both directions they are traveling to a separately gated park. A standard one-park ticket to Universal Studios Florida includes admission to Diagon Alley and the London area of The Wizarding World (and a one-park Islands of Adventure ticket grants access to Hogsmeade) But it doesn't allow entry into King's Cross Station where Platform 9¾ and the Hogwarts Express awaits. Guests trying to board the train with one-park tickets are directed to nearby, handy-dandy ticket booths where they can fork over an additional $55—per person—to upgrade their passes to two-park tickets. That's an extra $55 regardless of how many days of admission they've already paid for their base tickets. A two-day, single-park pass grants admission to either park for two days, but guests can't travel back and forth between the parks, and they can't get on the Hogwarts Express. The train has been driving a lot of park-to-park ticket upgrade sales. The need to upgrade passes may cause some on-the-spot confusion and perhaps a bit of irritation among some guests who arrive unaware of what kind of tickets they need to ride the train. But most visitors plan their visits in advance (which is recommended for any park excursion) and know about the necessity of park-to-park tickets. Once they realize they need and are paying for two-park tickets, most want to maximize the value and explore both parks. And once they understand that there is plenty more to explore besides Potter, including great attractions such as Despicable Me Minion Mayhem and Revenge of the Mummy, they consider staying longer than one day. Spending more than one day at the resort is something of a Holy Grail for Universal. When Universal Studios Florida first opened in 1990, the typical Central Florida vacationer carved out one day, if that, to break away from Disney World and visit the single park. When the second park, Islands of Adventure, opened in 1999 along with the CityWalk entertainment and dining district and the on-property Portofino Bay hotel, the calculus of how many days to spend at Universal changed a bit. When the original Wizarding World opened, it changed even more. Now, two-day visits (and higher; Universal also sells up to five-day passes) have become much more prevalent. Multi-day visits motivate more guests to consider staying at the resort's (wonderful) hotels and generate more revenue at its CityWalk establishments. And the increased attendance was spurred, in large part, by the Hogwarts Express. It's not just about higher attendance. It's about how much money those additional guests cough up. In addition to hotel stays and restaurant receipts, Universal has figured out ways to wring lots of other dollars from its visitors and boost per-capita spending to enviable levels. The incredibly popular (and highly addictive) butterbeer costs beaucoup bucks, especially when ordered in souvenir mugs. Along with the Wizarding Worlds, Universal introduced interactive wands. As soon as kids see other guests waving their wands and making cool things happen throughout the parks, they pester their parents to buy one—at a cool $52 apiece. Exorbitantly priced Hogwarts robes, Duff beer in The Simpsons' Springfield land, chocolate frogs: These and other costly temptations abound throughout the two parks and have guests constantly reaching for their wallets. The overall Orlando-area attendance pie might be growing, but there are only so many slices—so many days and so much discretionary income—to go around. Universal has made clever use of a highly coveted train ride to get visitors over to its resort.